Durations: 10 days / 9 nights. Locations: San Jose, Arenal & Drake Bay. Transfer from the Juan Santamaria International Airport to the hotel in San Jose. 2 nights at San Jose hotel with breakfast included. Doka Coffee tour + La Paz Waterfall Gardens. Transfers from San Jose to Pacuare River to Arenal Volcano. 3 nights at Arenal volcano area hotel with breakfast Included. Sky Tram & Sky Trek tour. Farm to table tour with lunch. Transfer from Arenal to Drake Bay (affordable and deluxe land transfer to San Jose and local flight to Drake Bay, Luxury private charter flight Arenal – Drake). Transfer to airstrip Drake Bay / Hotel. 3 Nights at Drake Bay hotel with meals included. Snorkeling tour in Caño Island. Regional flight from Drake Bay to San José. Transfer from air terminal to San Jose hotel. 1 night at San Jose hotel with breakfast included. Transfer from hotel to the Juan Santamaria International Airport in San Jose. After your arrival at Juan Santamaria International Airport, one of our staff members will pick you up to the hotel in San Jose. Day 2: Doka Coffee Plantation and La Paz Waterfalls. After breakfast, be ready for a day tour to Doka coffee plantation, you will discover all the process of the coffee and then continue to La Paz Waterfall Gardens. Walk through a trail, leading to a spectacular waterfall in the middle of the rainforest. Inside the park, we will also visit the hummingbird gallery, the serpentarium, the bird house, the butterfly garden and the frog’s exhibit. A wake up call for you next adventure, heading you to the Pacuare River for the best rafting experience in the country, you will river raft for around 4 hours. The tour we will continue to Arenal Volcano area. Upon arrival check in at your hotel in Arenal. After breakfast, let’s go for the Sky tram an Aerial tram tour that will take you over the canopy of the trees to get a different perspective of the forest. From the top of the mountain you will take a zipline down the mountain. Afternoon at your leisure. In the morning we will go for a hiking in the Arenal Volcano National Park. Later we will take you on a tour “farm to table” you will learn how to prepare local dishes. We will travel to the South Pacific coast to Drake bay near the Corcovado National Park. Upon arrival check in at your hotel. Afternoon at your leisure. After breakfast let’s ride on boat to the Corcovado National Park, discover an amazing hiking through the rainforest park. After breakfast, be prepare for a snorkeling tour by boat at Caño Island, one of the best spots in the country, also diving is available for additional cost. Morning at your leisure. 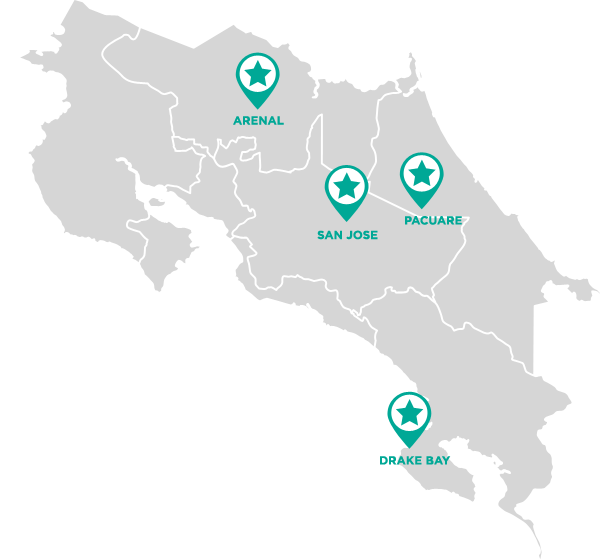 Around mid-morning transfer to local airstrip for your local flight back to San Jose. Upon arrival at San Jose transfer to your hotel. Overnight in San Jose. Depending on your international flight departure time we will take you to the Juan Santamaria International Airport, San José, on time for your flight back home.